Drunk Driving and Sobriety Checkpoints: What are My Rights? To combat drunk driving, sobriety checkpoints are becoming a standard fixture in North Carolina. Law enforcement is working hard to combat the number of alcohol-related accidents and deaths — and rightfully so. With more than 4,102 deaths from 2003 to 2012 caused by drunken drivers, the state should create measures to prevent further losses. However, implementing the use of sobriety checkpoints to catch drunken drivers is not always effective. Also, those subjected to these stops border on Fourth Amendment violations. 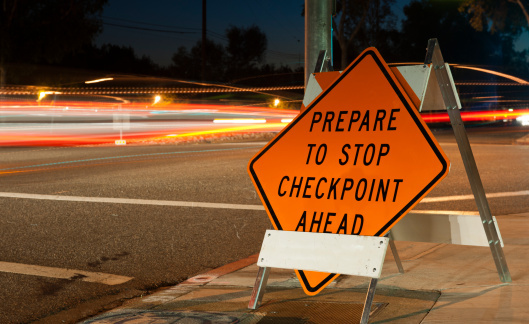 If your vehicle is stopped at one of these DWI checkpoints, you have rights. Even if you had a single drink at dinner, do not allow law enforcement to take advantage of that fact. You have rights at a sobriety checkpoint. While you might assume that DWI checkpoints are illegal, the state of North Carolina allows law enforcement to deploy these when they see fit. However, law enforcement is restricted as far as what they can do, and what would be considered a violation of your rights. You Cannot Avoid the Checkpoint: Even if you are innocent of drunk driving, never avoid a sobriety checkpoint. You cannot approach and maneuver to avoid one, or the police officers do have a right to track down your vehicle and question you. Even a legal turn before the checkpoint is reasonable suspicion enough for them to stop your car and test you. You Can Refuse the Test: You do have the right to refuse the breathalyzer test and field sobriety test. However, do so with caution. Refusing them is considered evidence enough for guilt for a DWI. Therefore, you could be convicted of a DWI without committing the act. Also, you will face license suspensions regardless of your BAC. Warrantless Searches are Allowed: Officers are not required to have a search warrant to test your breath or test you for other substances. If they smell alcohol or marijuana, they can also search your vehicle at these stops without a warrant. Officers Must Adhere to Strict Search Procedures: While the police could search your car and test you, they must prove that it was done at random. Therefore, the checkpoint must have a protocol in place to either search every vehicle or search at a specific number (i.e. every two vehicles). While law enforcement is provided with some flexibility at these sobriety checkpoints, errors often occur. Regardless of the reasons for your arrest at a checkpoint, you may have a viable defense strategy for the DWI charges. Therefore, contact a criminal defense attorney immediately to explore your options. The Law Firm of John C. Fitzpatrick, P.C. can assist you with your DWI case. Schedule a free consultation today at 919-683-9500 or send a message online with your legal questions.